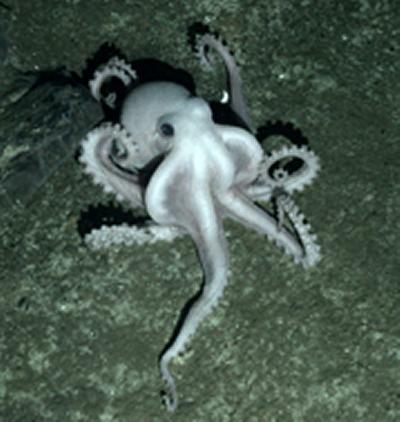 The discoveries, made by teams led by the University of Southampton, University of Oxford and British Antarctic Survey, include new species of yeti crab, starfish, barnacles, sea anemones, and potentially an octopus. For the first time, researchers have used a Remotely Operated Vehicle (ROV) to explore the East Scotia Ridge, deep beneath the Southern Ocean, where hydrothermal vents, (including ‘black smokers’ reaching temperatures of up to 382 degrees Celsius) create a unique environment that lacks sunlight, but is rich in certain chemicals. The team reports its findings in the latest issue of the online, open-access journal PLoS Biology. Hydrothermal vents are home to animals found nowhere else on the planet that get their energy not from the Sun but from breaking down chemicals, such as hydrogen sulphide. ROV dives were conducted with the help of the crews of RRS James Cook and RRS James Clark Ross. The discoveries were made as part of a consortium project with partners from the University of Southampton, University of Oxford, University of Bristol, Newcastle University, British Antarctic Survey, National Oceanography Centre, and Woods Hole Oceanographic Institution supported by the UK’s Natural Environment Research Council (NERC) and the US National Science Foundation (NSF).